Ravi Nitesh is an India-based human rights activist. He is the founder of Mission Bhartiyam, an organisation working in the fields of peace & harmony, human rights and environment. He is a core member of Save Sharmila Solidarity Campaign, a nation-wide campaign in support of Irom Sharmila and the repeal of AFSPA. In India, the world’s largest ‘democracy’, there is an activist named Irom Sharmila Chanu (popularly known as “Iron lady of Manipur”) who has been on hunger strike since November 2nd, 2000. Her hunger strike is the longest in the world and is still continuing. 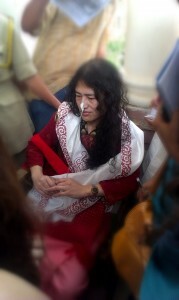 Irom Sharmila is demanding the repeal the Armed Forces Special Powers Act 1958 (AFSPA). She started her hunger strike after the ‘Malom incident’ (also known as the Malom massacre), wherein 10 people, who were waiting at bus stand in Malom, were killed in the indiscriminate firing of the Assam Rifles. Irom became so affected by this incident that she decided to go on a protest against the AFSPA which permitted this and similar such incidents. The AFSPA is a law which grants arbitrary powers to the armed forces. It empowers the armed forces (even non-commissioned officers) to shoot on mere suspicion, to arrest without warrant, to destroy property and to enter and search under section 4. But it doesn’t stop here. The AFSPA also provides legal impunity to the armed forces. In the case of arrests without warrant, while the normal procedure elsewhere in India is to produce the person before the magistrate within 24 hours of arrest, section 5 of the AFSPA states that ‘Any person arrested or taken in to custody under this act shall be made over to the officer in charge of the nearest police station with least possible delay, together with a report of the circumstances occasioning the arrest’. A loophole has been created by the ‘least possible delay’, wherein no time frame is mentioned thereby creating an ever-increasing list of cases of disappearance. The AFSPA was imposed in north eastern states of India (except Sikkim) and was later extended to Jammu & Kashmir as a counter insurgency law. It was passed by parliament without much debate and in spite of the objections of a few parliamentarians who were from the concerned regions. Since then, this law has continued in the same manner and this ‘counter insurgency’ strategy has not been changed or reviewed. The law has resulted in extra-judicial killings, rapes, torture, disappearances and fake encounters with security forces. From the local public and organisations, to national and international organizations and individuals, many have come together to oppose this law. But because of section 6 of the AFSPA, which holds that no prosecution can be allowed against security personnel without prior permission from central government, the government has not allowed a single sanction for prosecution, despite several proven examples of human rights violations. Irom Sharmila Chanu has been on a hunger-strike to repeal this law. The Manipur government lodged a case of “attempted suicide” when she started her strike in 2000. But in all case hearings, Irom Sharmila has always maintained that she does not want to commit suicide, instead she loves life and is fighting for people. She has re-iterated several times that, “I love my life but I want justice and peace”. Under section 309, the maximum punishment awarded is of up to one year and so every year, the court release and re-arrest her for the same case. During one such release, in 2006, Sharmila went to Delhi and offered a floral tribute on the memorial of Mahatma Gandhi, the father of the nation who also chose the path of hunger-strike during the colonial period. She then resumed her strike in Delhi. The Manipur government has kept her prisoner in a security ward of Jawaharlal Nehru Hospital, Manipur, where she is force-fed through nasogastric intubation. She has not taken even a morsel or a drop of water through her mouth for 14 years. But still in these 14 years, the government has not taken any step to talk to her. On August 19th 2014, the Imphal court ordered the release of Irom Sharmila on the grounds that there was “no supportive evidence for attempted suicide”. Sharmila was finally released, however, the government quickly registered a fresh case and re-arrested her after two days. During the arrest, she was dragged by security personnel and dumped in a jeep. During her hearing at New Delhi in May, I had the opportunity to meet her. It was quite surprising and inspiring to see how she was so full of positivity and hope. In spite of suppression by the government, she expressed her hope for democracy. She never became irritated and did not say anything against the government. I also met her during the court trial when the court was adjourned for lunch. It was revealed by the nurses who had accompanied her that Sharmila had been in court since the morning but, due to delay in court proceedings, it had not been possible to feed her through the nasal tube. The court was not bothered. I felt sad to see a lady who has not eaten for 14 years waiting for the court’s lunch break to end, but it had not bothered her. During the hearing, she again re-iterated that she loves her life and is not committing suicide. The court did nothing except give her the date for the next hearing. This has been happening for 14 years in the ‘world’s largest democracy’. Irom continues to protest against the AFSPA, the AFSPA continues to violate human rights and the Government and judiciary continues to turn its back. This entry was posted in Activism and tagged hunger strikes, India, law, politics, women. Bookmark the permalink. It’s good that LSE students learn about Sharmila but Mr Nitesh misses the point of the trial in Delhi. For Sharmila its her window on the world. It’s also the political and media centre of India. The court issued a production warrant for the SSP Imphal Central Jail to produce his prisoner for trial on 30-31 October 2014, this is due process after her arrest in October 2006 by the Delhi Police. Of the previous 13 production warrants and summonses the Government of Manipur has blocked 11 on specious grounds. If they send her Delhi sees her and possibly the Capital’s politicians and media. The trial is a positive thing and the right to trial within a reasonable time one of her fundamental human rights. It is a pity so called activists are so obtuse on positive tactics. The attempt to have all charges dropped in Manipur would have resulted in her premature death yet it was so called activists who pushed for this while the Government of Manipur pretends to want to keep her alive. If students google though no doubt they can find out more. One other obvious thing if anyone at this human rights centre wished to show Sharmila support they can write to Irom Sharmila Chanu, Human Rights Defender, Security Ward, Jawaharlal Nehru I M S, Porompat, Imphal East, Manipur 795005, India. Letters from abroad make up for what is lacking in the tepid support at home.